Cheung Chau is an island about six miles southwest of Hong Kong. Translated it means "Long Island," so named due to its elongated shape. 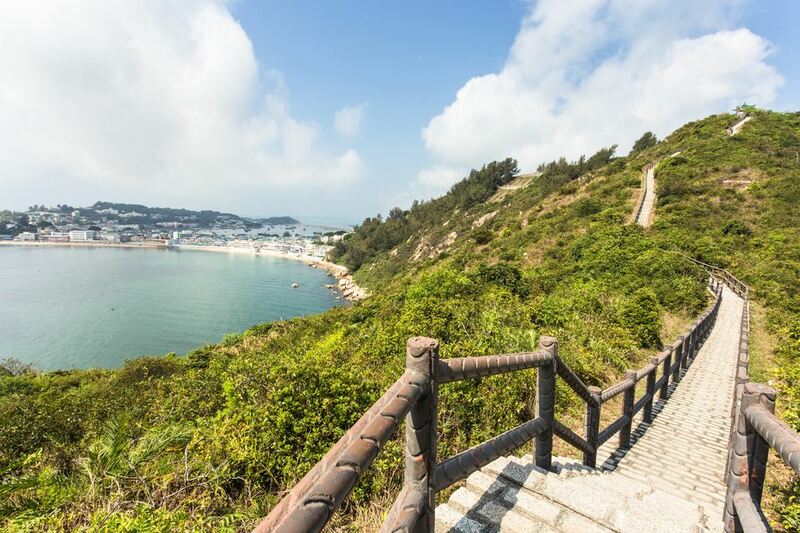 From the relaxing seaside lifestyle to the spectacular seafood to the rock sculptures and temples, Cheung Chau is an ideal escape from the bustling city life of Hong Kong and is perfect for a day trip (there really isn't a selection of overnight accommodations). So how do you get there? Since it is an island, Cheung Chau is accessible by ferry only, either departing from Hong Kong or Lantau. Run by the New World First Ferry Company, the regular ferry service leaves from Central Pier #5 on Hong Kong Island. To get to Central Pier, you can take MTR to Central station or Hong Kong station and walk on the elevated walkway system toward the water to Pier #5; the piers are numbered one through 10 so it is easy to find. Ferries between Central and Cheung Chau run roughly every 30 mins—more during commuter times—usually at 15 and 45 mins past the hour, mainly between 9:45 a.m. and 4:45 p.m. Otherwise, the ferries leave on the hour, 10 after, or 20 minutes after. Check the schedule carefully as sometimes refer to Saturdays only. There are also a few ferries that run between midnight and 6:10 a.m. There are two types of boats that run between Hong Kong and Cheung Chau: the fast ferry and the slow (or ordinary) ferry. The fast ferry takes 35 to 40 minutes while the slow's trip is about an hour. (Water traffic and weather can affect these timeframes.) Besides the speed of the boats, the ferries are different sizes and have varying seating arrangements. The fast ferry is smaller than the ordinary ferry but is still large enough to hold hundreds of people in comfortable cushioned seats (similar to those on an airplane). The cabin is air-conditioned which is a welcome relief on a hot summer day. If you have the time, the slow ferry is a nice choice, as it allows you to enjoy the scenery while sitting on an outdoor deck. The "deluxe class" upper deck (available for an extra fee) provides access to the back observation deck on many of the slow ferries. New World First Ferry Company runs an inter-island ferry that leaves Mui Wo on Lantau and then makes stops at Peng Chau and Cheung Chau. This is a wonderful way to take in the outlying islands. To get to the ferry on Lantau, take a bus to the Mui Wo stop which is right next to the pier. This boat is smaller with two decks and outside observation and takes 35 minutes. If you’re traveling to Cheung Chau for the bun festival, there will be extra ferries servicing the route. However, the ferries are sure to be crowded and since it is first-come-first-served, you may have to wait for the next ferry if the one you're trying to get on is full. A good alternative for large groups is to hire a private junk which offers flexibility, and when split between friends isn't so expensive.